FYF Fest returns to Exposition Park in Los Angeles on Aug. 27 and 28 this year, and the lineup today has been revealed. Headlining the festival this year are Kendrick Lamar, Tame Impala, the newly reunited LCD Soundsystem and Grace Jones. 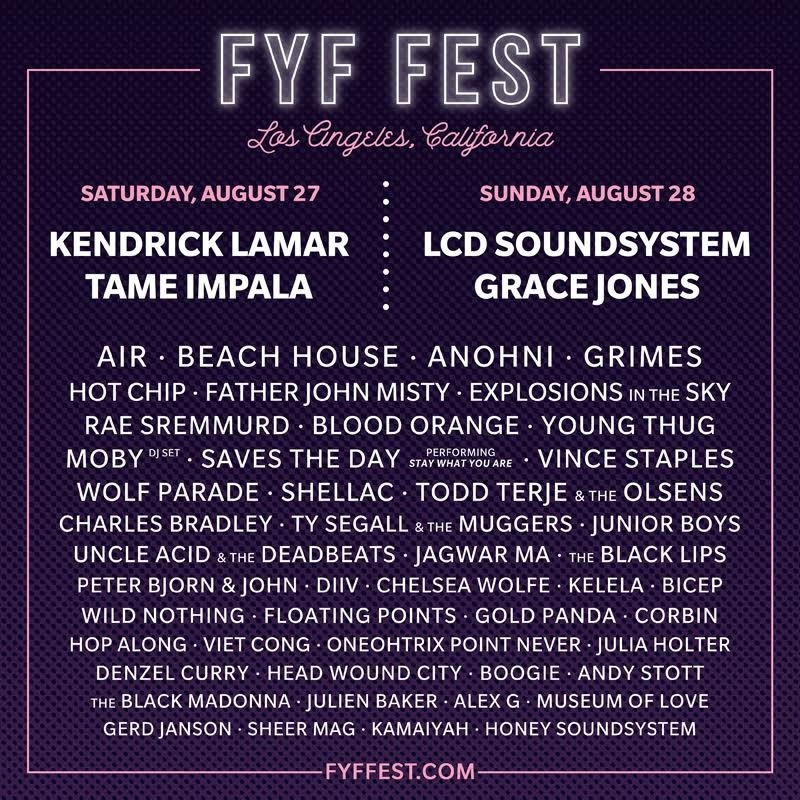 Also on the FYF Fest 2016 lineup are Grimes, Beach House, ANOHNI, Air, Chelsea Wolfe, Father John Misty, Vince Staples, Young Thug, Blood Orange, Shellac, Wolf Parade, Charles Bradley, Ty Segall and the Muggers, Hot Chip, Explosions in the Sky, Rae Sremmurd, Black Lips, Junior Boys, Todd Terje and the Olsens, Kelela, Floating Points, Wild Nothing, Diiv, Viet Cong, Hop Along, Oneohtrix Point Never, Andy Stott, Head Wound City, Alex G, Sheer Mag, Kamaiyah and more. See the full lineup at the FYF Fest website or on the poster above. Read our FYF Fest 2015 report.